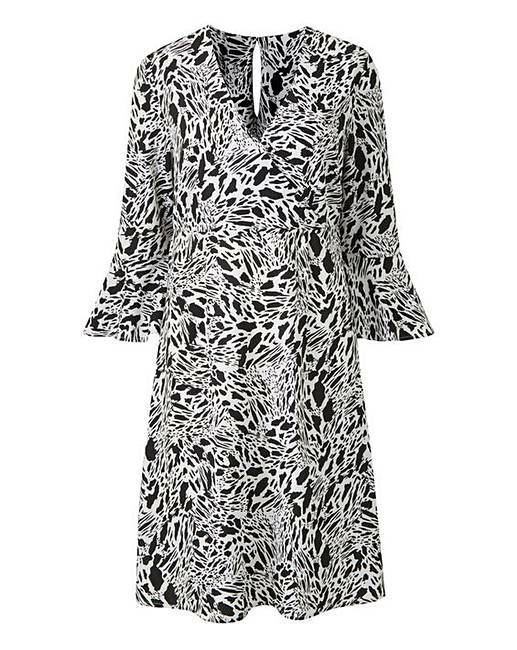 Mono Animal Print Wrap Dress is rated 2.3 out of 5 by 3. The Fluted-Sleeve Wrap Skater Dress has been updated with a stylish mono animal print. This classic shape skater dress with wrap detailing is a key piece this season as animal print continues to dominate trends going into SS19. Style with chic black block heels or boots for a daytime attire. Simply Be design recommend a classic black waist belt to complete the look, but we know with your style you can make this rock with or without. Rated 1 out of 5 by Yearsley13 from Poor Quality I bought this dress a few weeks ago and wore it on a night out and I’m so disappointed! It has a little press clip on the bit that crosses over at the front and I spent the whole evening trying to hold it together as wouldn’t stay done up! Also the lining kept coming out too It’s a lovely looking dress and fits lovely but not made well at all! I will be contacting customer service to return!